You may not win your fantasy football league with your first round pick, but you can certainly lose it. Unless that first round choice is C.J. Spiller. My top 100 rankings came, of course, with general criticism. I expected it; it’s a massively subjective piece, and the fact that I devalue quarterbacks never helps. But one player – C.J. Spiller – was at the heart of many discussions once the Top 100 was revealed. “How can you have Spiller at number two overall?” said someone on Twitter. “He’s in a running back-by-committee system, bro” mentioned another follower. I get it. Fred Jackson exists, Spiller has never received a heavy workload and there’s a new regime in Buffalo. To top it off, Ryan Fitzpatrick is one of the worst starting quarterbacks in the NFL. But while there are plenty of easy negatives to throw at the Bills’ running back, there are also dozens of positives. In fact, you could argue that there are more good things about Spiller than any other player in the fantasy football landscape. While his yards per carry average is well above the rest of the competition, the statistic is skewed by lack of goal line carries. However, if we compare his numbers to Jamaal Charles – a player with extremely similar red zone attempts – we see that Spiller appears to be the better option in the red zone of the two. That should, at the very least, create some sort of ease for owners debating between the two backs under this metric. But the main point to make here isn’t about what these running backs did in 2012. It’s about what they can do in 2013. If we look at history, the number of rushing attempts within an opponents 10-yard line can, and will, certainly fluctuate. For instance, in 2011, Arian Foster had 27 of them. Last season, this number jumped to 42. That’s fairly significant when you figure he scored once every 3.4 carries from this distance in 2011. And while we’re not expecting Spiller to reach, say, 20 carries from this range next season, isn’t it attractive to think that he was the seventh best fantasy back in 2012 while only getting six carries within the opponents’ 10 yard-line? If that doesn’t scream opportunity, regardless of how the committee situation works in Buffalo, then I don’t know what does. The now 32 year-old Jackson played in 10 games last season, posting 115 attempts for 437 yards and three scores on the ground. He added 34 receptions and 217 receiving yards to that as well. What’s glaring about his numbers, regardless of the sample size, is that Jackson’s average yards per carry dropped to 3.8. In the past, Jackson hovered around a five yards per carry average. The 3.8 average was easily the worst single-season average of his career. And while Jackson claims he was never 100 percent last season, the fact that his longest run was just 15 yards is quite disheartening after the fantastic start he had back in 2011. With Jackson in the lineup last season, Spiller averaged 10.3 carries and 2.6 receptions per game. And in those 10 games, Clifford scored 10 fantasy points per contest, posting more than 9 points in 70% of them. If he had averaged this over the course of the 2012 season, he would have finished as the 14th ranked running back in fantasy football. And, remember, 70% of those games would be worthwhile, solid starts. But we have to also recognize that Spiller was able to capitalize when Jackson went down to injury last season. Without Jackson, Spiller averaged 17.3 carries and 2.8 receptions per game. His 20 touches each contest led to a fantasy average of 16.5 points per game, which was a whole fantasy point more than Arian Foster’s average in 2012. The only running back with a better average per game in 2012 was, of course, the 2,097-yard Adrian Peterson. Given Spiller’s success without Jackson, he’s bound to obtain more touches in 2013. But even if he doesn’t, and even if his efficiency drops, he’s likely to be, at worst, a very usable RB2. Chain Gailey is finally out, and ex-Syracuse Orange head coach, Doug Marrone, will be running the show in Buffalo. Should we be worried? In short, not at all. The #FireGailey hashtag was widespread on Twitter throughout the 2012 season, and for good reason. He had no idea how to get his offensive playmakers the ball, and his defense, after making solid acquisitions in the off-season, finished 22nd in the NFL in yards allowed. Marrone, who was the offensive coordinator in New Orleans from 2006-2008 before taking the job at Syracuse, has quite a successful track record. Not only did he rejuvenate a near-dead Syracuse program, but in New Orleans, Marrone successfully coached the Saints’ offense to two top-five scoring seasons in the three seasons he was there. Reggie Bush, a rookie when Marrone first took the job in New Orleans, averaged 11 carries and nearly 8 catches per game under Marrone’s offensive lead. And that was on a team that utilized multiple running backs each game. While the new Bills’ head coach has used a running back-by-committee approach in the past, he’s also been creative in getting his playmakers the ball. This sentiment has also been echoed by running backs coach Tyrone Wheatley, who has said the team will run multiple sets in 2013 with both Fred Jackson and C.J. Spiller on the field. And for some substance to this idea, Reggie Bush’s best season averages of his career, given the time he missed due to injury, were during his first three seasons in New Orleans. Is a 60-plus reception season in store for Spiller? I’d like to add that Spiller is a better (and less selfish) runner than Bush has ever been in the NFL, too. Many have compared the two backs, and that’s caused less love for Spiller. But consider this: Spiller received 207 carries and broke 53 tackles in 2012. That’s one less than Bush has broken over the last two seasons combined (on 443 carries). Marrone should have no problem getting his best offensive player the ball in 2013. And as I’ve pointed out, Spiller doesn’t need the world in order to be an effective fantasy player. If he receives 300 total touches, he could be fantasy gold. I won’t get into why I completely disagree with Rodgers being a top-5 pick, but the idea that is presented here is a good one. Why should we, in a year filled with talent in the first round, select an unknown like C.J. Spiller? I think we generally fail to see concerns with proven players. 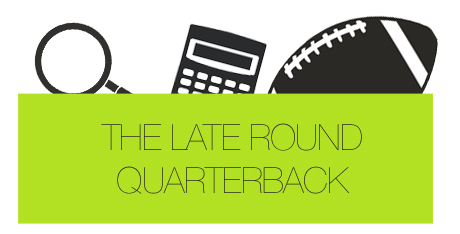 Quarterbacks don’t warrant top-round selections for many reasons, and receivers are simply devalued in standard leagues when compared to runners. That leaves us with these running backs, which to many (though untrue), are less consistent and predictable than other positions. Everyone wants a sure bet early on, and by taking a player like Spiller, you’re not getting one. But I think that’s unfair judgment. Arian Foster, even as a fantasy stud over the last few seasons, has question marks surrounding him because of his massive use in the Texans’ offense in 2012. Ray Rice, who is ahead of Spiller in plenty of early rankings, just went through an extensive playoff run and has Bernard Pierce in the rearview. And even second-year players like Doug Martin and Trent Richardson have question marks simply due to uncertainty. Everyone is risky in some way. Just because you haven’t seen C.J. Spiller perform as a top-5 back doesn’t mean he can’t. There’s certainly an aspect of risk associated with C.J. Spiller, but there’s risk with anyone you draft in fantasy football. Really, nobody does more with the ball – in terms of fantasy football – than the Bills’ young runner. There’s opportunity for Spiller in a new offense, and head coach Doug Marrone has shown to utilize his playmakers in the past. C.J. Spiller is the kind of player that can heavily contribute to a fantasy championship. If Spiller plays at the level he did in 2012 and receives the kind of touches a talented running back has received in previous Doug Marrone offenses, then he’s going to be one of the best assets in fantasy football during the 2013 season.